October 26th, 2017 – St. Louis, Missouri – Story of the Year has announced they will be releasing their first full-length album since 2010, Wolves, on December 8th, 2017.Produced by Aaron Sprinkle (Anberlin, New Found Glory, Acceptance)and mixed by Tom Lord-Alge & J Hall, this 6th studio album is a testament of how inspired and committed they are to making their best record yet. Wolves is available for pre-order via Pledge Music now, with public pre-orders available next Friday, November 3rd. Yesterday, the band released their first behind-the-scenes look to the album in a webisode, which fans can check out HERE. This is the first of many that will countdown to the album release on December 8th and in classic SOTY form, they are going to be fun. Story of the Year fans have been singing along for the past 17 years to hit songs like “Until The Day I Die,” “Anthem of our Dying Day,” “Take Me Back,” “Wake Up” and more. The album pre-order and other exclusive early access to behind the scenes videos, upcoming singles and more can be found here: https://www.pledgemusic.com/projects/storyoftheyear. 7. Can Anybody Hear Me? 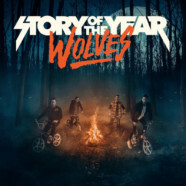 Story of the Year is Dan Marsala: Vocals, Ryan Phillips: Guitars and Computers, Josh Wills: Drums, Philip “Moon” Sneed: Bass and Vocals. They have previously released five studio albums — Page Avenue, In the Wake of Determination, The Black Swan, The Constant and 10 Years and Counting: An acoustic reimaging of Page Avenue.